Taxi dispatch companies are mushrooming left right and center. If you land up in a new city and look for ride-hailing taxi service, I am sure you will have options of at least half a dozen. Know more about Taxi Dispatch Software for complete solutions for your Taxi Business. In this blog, we shall review Comfortdelgro, a major taxi dispatch company quite popular in South Asian countries like Singapore. 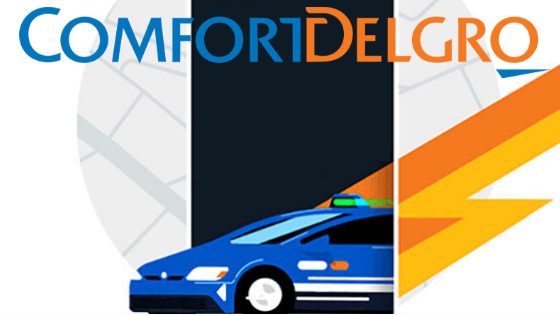 ComfortDelGro Corporation owns two taxi dispatch companies, namely Comfort taxi and City Cab Limited. These companies are the largest players in Singapore’s taxi industry scene and own a massive fleet of around 15,000 taxis together. People who have used their services unanimously say that ComfortDelGro taxi booking system, is one of the best in the world. Comfortdelgro connects its taxi vehicles using the GPRS (General Packet Radio Service) technology. And this is done through the Mobile Data Terminals (MDTs) built inside the vehicles. Comfortdelgro also gives prime importance to its customers and hence they provide round the clock customer care services. It is estimated that they cater to over 20 million taxi bookings every year. On a global scale, ComfortDelGro is a public listed passenger land transport company and owns more than 38,700 vehicles around the world. Or in short, ComfortDelGro has an entirely global outlook with a large shareholder base workforce globally! ComfortDelGro actually began their operations in the early 1970s. And before they were two different land transport companies, namely the Comfort Group and the DelGro Corporation. It was on 29th March 2003 that ComfortDelGro Corporation was formed by merging the two. Another milestone of the company includes its listing in the prestigious Singapore Stock Market. The services offered by the ComfortDelGro Corporation is wide and unique. They concentrate in multiple fields like taxi, bus, and rail services, automotive engineering works, inspection, and testing services, car rental and leasing, insurance broking services, outdoor advertising, vehicle inspection services, driving learning centers and much more…! Comfortdelgro has two subsidiary companies under its control. And they are SBS Transit Ltd and VICOM Ltd. These two companies are listed on the Singapore Stock Exchange. SBS Transit is the largest public bus transport operator of Singapore and has more than 3000 buses under their wing! Also, they take care of the urban rail operation. It is estimated that they serve more than 2 million passengers on a daily basis. The subsidiary company of Comfortdelgro, VICOM Ltd. provides inspection, test and assessment services. Comfortdelgro group is one of the largest players in the taxi sector of Singapore with a fleet of more than 17,000 taxis on the roads. Comfortdelgro has its coverage in more than a dozen countries around the world. Their major areas of operation in addition to Singapore include the United Kingdom, Vietnam, Malaysia and the Chinese cities of Beijing, Shanghai, Guangzhou, Shenyang, Chengdu. etc. All the users of the cab say that the drivers of Comfort cabs are very courteous in nature. All of them are very fluent in English and this makes the company a preferred one by tourists. The dispatch system is very well efficient. The average wait time is anywhere between a minute to 5 minutes depending upon the location. And lastly, most of their cabs are equipped with alternative payment methods such as NETS and credit card machines, because many of the millennials prefer to go cashless these days and it prevents the awkward situation where you don’t have sufficient cash to cover the taxi fare. Overall, it is a preferred transport service by most of the southeast Asian population, especially in countries like Singapore. The service is definitely recommendable. Several companies operate successful taxi companies in Singapore and also read a detailed review of HDT – the electric powered taxi of Singapore. If you want to build a taxi dispatch business like Comfortdelgro or HDT, get your hands on the best Taxi Dispatch Software Demo.